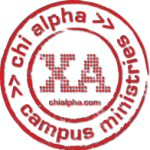 We are Southeast Missouri State Chi Alpha and just one of over 300 universities across the nation that are home to Chi Alpha Campus Ministry. We are an open community of Jesus followers who get together weekly to connect with God and other people. Our desire is to demonstrate and share Jesus’ love with every person because every person is valuable and deserves to be loved. We want to see young adults genuinely know Jesus and experience life His way through personal change, genuine relationships, and an authentic lifestyle. Everyone is welcome to be a part of Chi Alpha. We would love to get to know you and hang out with you. For more information, check out the rest of our website, give us a call, or send us an e-mail through our Contact Page. Thanks! Chi Alpha is sponsored by the Assemblies of God. That means the A/G provides each local campus with support, resources, and connectivity to a larger worldwide movement. They also work to equip the leaders of each local XA, both the vocational missionaries associated with each group and the student leaders. The sponsorship by the Assemblies of God does not mean that you have to have a history with the A/G. You don’t have to have any particular denominational connection to be welcomed in our groups.